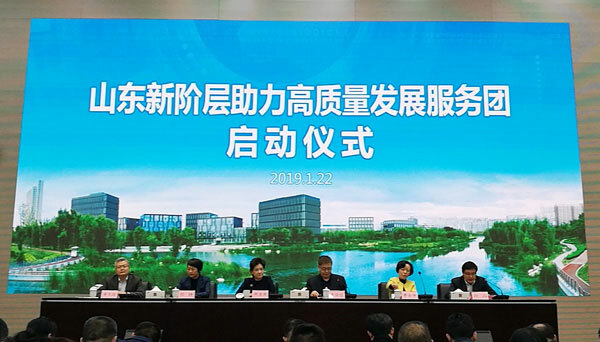 On January 22nd, Shandong New High-Level Development Service Launching Ceremony was held in the Management Committee of Jining High-tech Zone. Xing Shanping, Member of the Standing Committee of the Shandong Provincial Party Committee and Minister of the United Front Work Department. Li Faxin, Vice Minister of the United Front Work Department of the Provincial Party Committee. Zhang Jing, Vice Minister of the United Front Work Department of the Provincial Party Committee. Cao Jinping, President of the Provincial Federation of Social Organizations and Deputy Director of the Provincial Water Resources Department. Huang Yuyuan, member of the Party Committee of the Provincial Taxation Bureau, chief economist, and secretary of the industry party committee of the Provincial Association of Certified Tax Agents. Song Haiwei, Director of the Office of the United Front Work Department of the Provincial Party Committee. Yang Hongyu, Director of the Second Division of the United Front Work Department of the Provincial Party Committee. Zhang Shengli, Director of the Eighth Division of the United Front Work Department of the Provincial Party Committee. Baishan, member of the Standing Committee of the Jining Municipal Committee and Minister of the United Front Work Department.Wang Yanan, Executive Vice Minister of the United Front Work Department of the Municipal Party Committee. 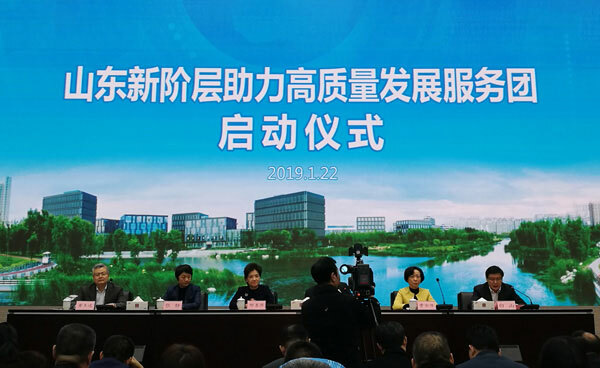 Li Kexue, Chairman of the City Federation of Industry and Commerce.Wang Chengyu, deputy director of the United Front Work Department of the Municipal Party Committee and party secretary of the Municipal Federation of Industry and Commerce. Liang Jiankun, deputy director of the United Front Work Department of the Municipal Party Committee, and other provincial and municipal leaders attended the meeting. As a key private enterprise in Jining City, China Coal Group was invited to participate. Group General Manager Han Yong and Chief Financial Officer Yang Qingqing attended the meeting on behalf of the Group. At the launching ceremony, Bai Shan, Huang Yuyuan and Cao Jinping delivered speeches to the conference. Minister Bai Shan expressed his congratulations on the launch of the new high-level development service group in Shandong. He said that he hopes that the private enterprises in the city will make full use of the great opportunity of the service group to help enterprises develop, take the initiative to adapt to the new situation, and firmly adhere to the high-quality development. Road, solidly cooperate with all kinds of work, take the initiative to do a good job of docking, take the initiative to introduce the situation, strengthen communication, listen to the valuable opinions of the absorption service team, and achieve better and greater development of the enterprise! During the meeting, Xing Shanping pointed out that the provincial party committee's work of "Thousands Of Cadres At The Grassroots Level" is a major deployment to implement the internship of General Secretary Xi Jinping to inspect Shandong's important speech and the spirit of important instructions for Shandong work, and to solve the current economic and social development of our province. Highlight important issues and crack down on important measures that constrain the bottleneck of high-quality development. It is hoped that the comrades of the service team will be based on the actual situation of the enterprise, help to sort out the development ideas, solve the practical problems encountered, and better assist the high-quality development of private enterprises in Jining City. General Manager Han said that as a key private enterprise in the city, China Coal Group will resolutely implement the decision-making and deployment requirements of the provincial party committee and the municipal party committee, actively connect, strengthen communication, strengthen the enterprise's own construction, and unswervingly follow the path of high-quality development, while increasing scientific and technological research and development. Innovate and strive to make more contributions to the development of the city's private economy!